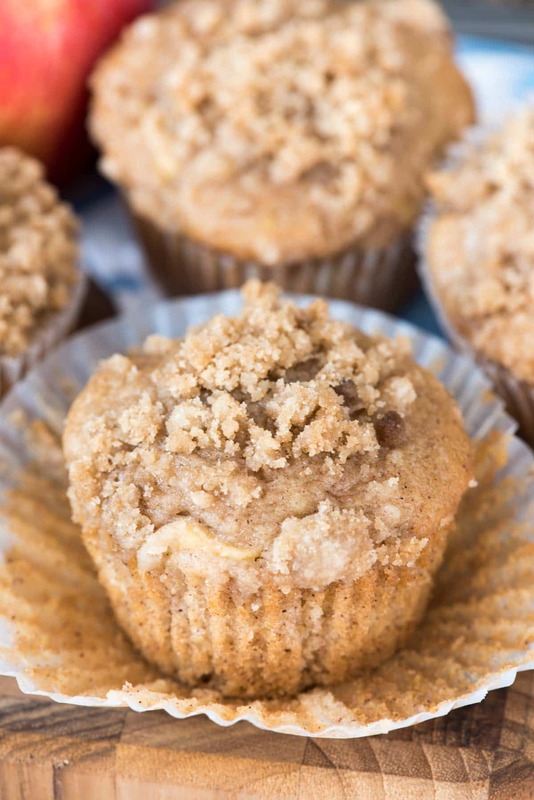 Crumb Apple Muffins – a fluffy cinnamon apple muffin filled with apple chunks and topped with a brown sugar crumble. The perfect breakfast muffins recipe! 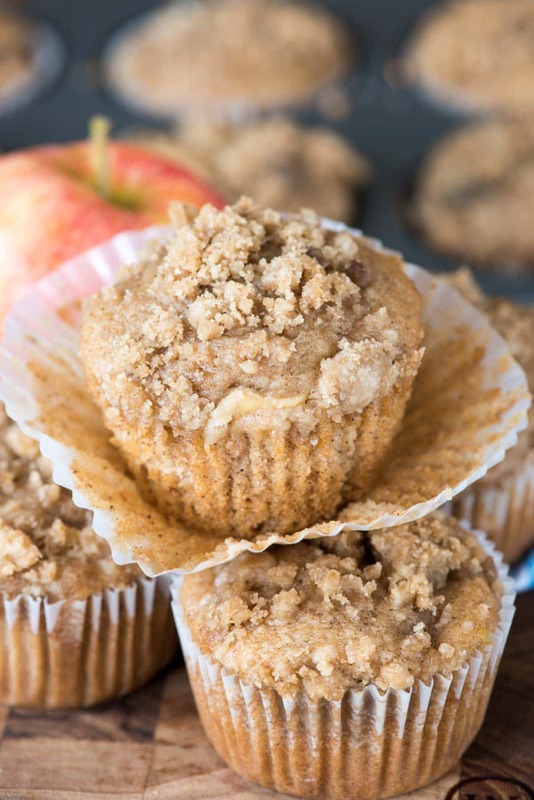 Are you ready for this crumb apple muffins recipe? I totally teased them a few weeks ago, when I posted about my 24 hours in Napa. They had these amazing crumb apple muffins at the hotel bakery and they were probably the best muffins I’ve ever had. I knew immediately I had to recreate them. I have a love affair with crumble. I fell in love with pie because my favorite apple pie recipe has double the crumble on top. It is crunchy and amazing and makes the filling worth it. Honestly, if I had to choose the best pie recipe, it would be crumble pie…no filling. My love of crumble expanded once I started making pie bars and cheesecake bars with the crunchy topping. And then I realized you could put crumble on muffins. THAT was the best day ever. It all started when I made lemon crumb muffins a few years ago. 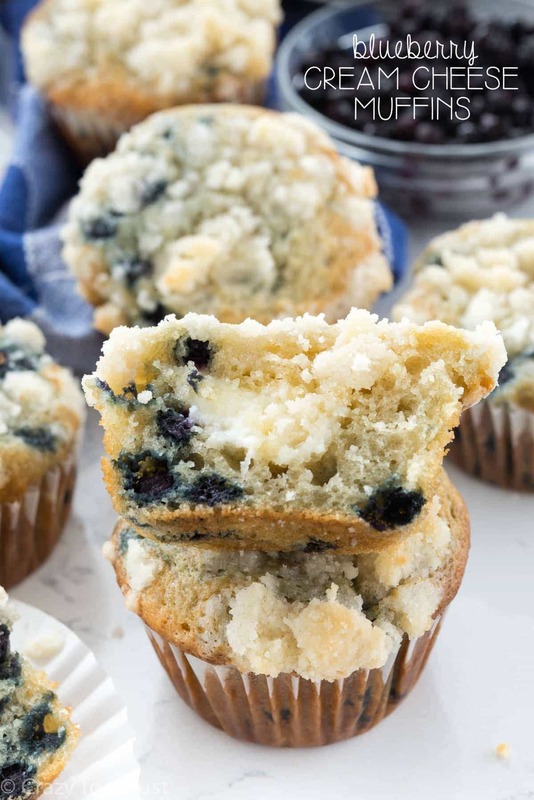 That was also my aha moment with muffins, when I found my favorite muffin recipe. 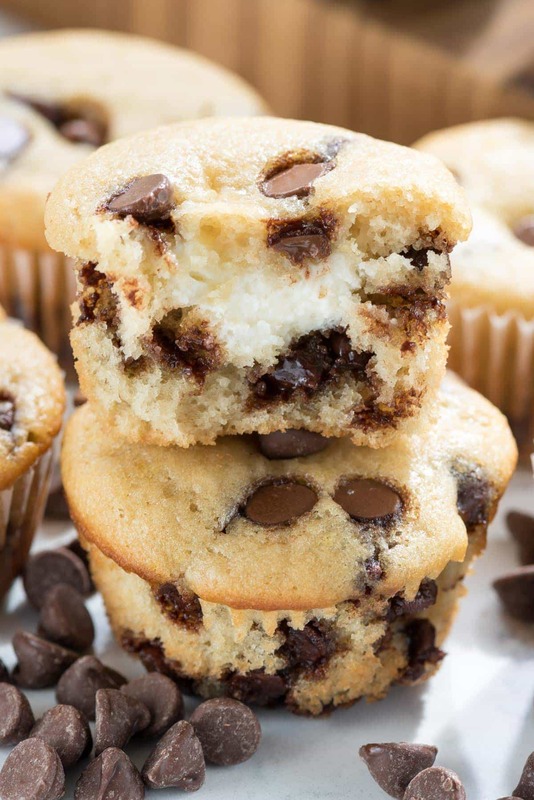 The recipe uses vinegar, sour cream, and baking soda instead of powder and I find them to be softer and fluffier than any other muffin I’ve ever eaten. I quickly followed up by making Blueberry Crumble Muffins with a cheesecake filling. So, when I ate those apple crumb muffins in Napa, I knew EXACTLY what and how I was going to remake them. And guess what? I totally did. And they’re pretty darn close, if you ask me. So, let’s talk muffin anatomy. As I said before, the base of the muffin has all the basics: oil, eggs, sugar, flour, etc. The leavening is done with a combination of baking soda, vinegar, and the sour cream. Combined with the eggs these muffins get puffy and perfect. They don’t dome quite like a baking powder muffin does, but they taste way more airy and good. I also added cinnamon to the batter, because I was going for an apple/fall flavor. And, of course, apples. Did you know that you can cook apples in the microwave? I hate adding raw apples to recipes because they end up crunchy in the end product (and often add too much water as they cook). I like to pre-cook my apples for pie and other recipes, and these muffins are no different. I just sliced up the apples and added them a bowl with some water and cooked them for a few minutes in the microwave. Once you drain them you can add them to your batter and they cook up nice and soft in the muffin. Let’s not forget the crumble topping…that’s the best part. My normal muffin crumble uses butter, flour, and granulated sugar, but I used brown sugar for these because I just thought it would pair well with the apples. I was right! 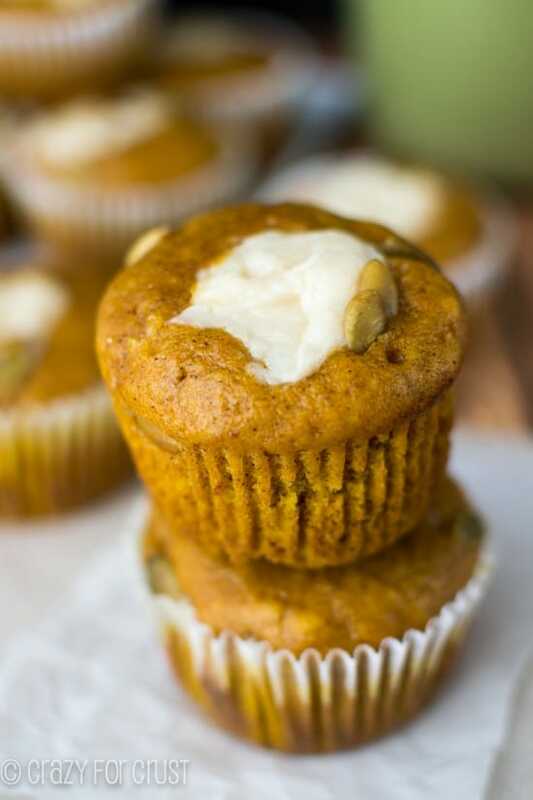 The crunchy topping pairs with the soft muffin and the entire thing is filled with cinnamon apple flavor. These are the perfect breakfast or brunch recipe, especially this time of year! Easy Crumb Apple Muffins - a fluffy cinnamon apple muffin filled with apple chunks and topped with a brown sugar crumble. The perfect breakfast recipe! Preheat oven to 350°F. Line muffin pans with paper baking cups. Make the apples: place the diced apples in a medium sized microwave bowl. Add about 1/2” of water in the bowl and microwave for about 2 minutes, or just until the apples start to get a bit translucent/opaque but aren’t cooked all the way through. Drain them well, then sprinkle with cinnamon and sugar. Set aside. Make the topping by stirring together all topping ingredients with a fork in a medium sized bowl. Set aside. Using a hand mixer or wooden spoon, mix eggs with sugar and oil, beat until creamy. Mix vanilla, vinegar, baking soda, cinnamon, and salt. Mix in sour cream then stir in flour using a wooden spoon. (Batter may be slightly lumpy.) Stir in apples. Fill muffin cups 2/3 full of batter (about 1/4 cup per muffin cups) Sprinkle the crumble evenly over the top of the muffins. Bake for 15-19 minutes until a toothpick comes out clean from the center of a muffin. Cool 5 minutes in pan then remove to a rack to cool completely. Store in an airtight container for up to 3 days or freeze for up to one month. I just made these and they’re unbelievably tasty!! I love how fluffy and moist they are! I assume that’s the result of a reaction between the baking soda, vinegar, and sour cream. Thanks for sharing! If I don’t have a microwave to cook the apples, can I cook it over the stove, instead ?